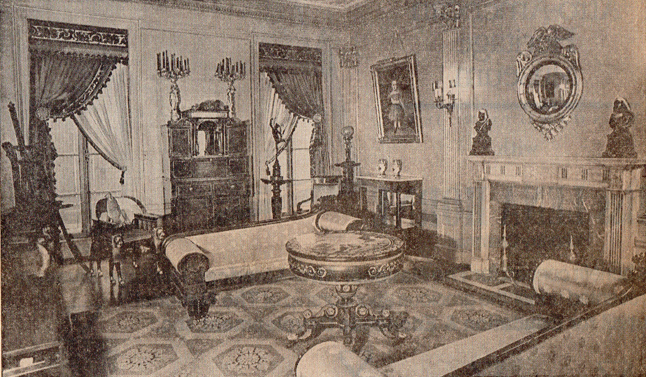 Warhol’s back sitting room with painted and stenciled Baltimore center table, circa 1825, and carved and gilded recamiers (couches), circa 1835. Andy Warhol’s oversize pop images of Campbell soup cans, Brillo boxes, and Marilyn and Mao in flaming red lipstick spark instant recognition. 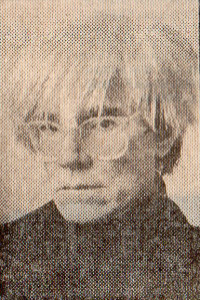 But Warhol, the late platinum-wigged prince of pop, had another lesser known persona; that of collector extraordinaire, a connoisseur with a golden eye. Starting on April 23 with Warhol’s art nouveau and art deco collections, Sotheby’s will auction. more than 10,000 items in 10 days. Estimates of the prospective sales range from $10 million ‘ to $15 million, covering contemporary art, American and English decorative arts, precious objects, impressionist and modern arts, and primitive art. Proceeds from the marathon event will benefit the Andy Warhol Foundation for the Visual Arts. The dizzying armada of objects ranges from battery-powered space toys to a 1974 Rolls-Royce; from a Kwakiutl Indian mask to a 1912 Picasso drawing to a macabre poster from a 1968 London Evening Standard headline, “Pop Art Shooting—Actress Accused.” Even after a team of curators and experts spent months cataloguing the con-tents of Warhol’s six-story East 66th Street town house, treasures continue to spill from overlooked crannies. The fruit of the research is a $95, six-volume, catalogue—a kind of spending spree biography chock-full of personal photographs and remembrances of friends and colleagues—which weighs in at more than eight pounds.’ Each glossy cover includes the icon-like Warhol Collection label’, a fashionable head shot in miniature of the great accumulator. On a recent tour of the splendid turn-of-the-century building, rooms that had once bulged with a pack rat’s detritus had been uncluttered and rearranged into museum-style installations. A gi-ant plaster bust of Napoleon by the neoclassical sculptor Antonio Casanova glared from its perch above the guest register. 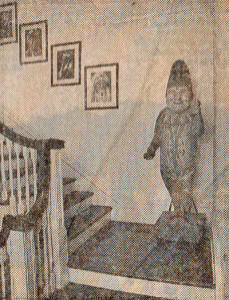 The dining room was uninspiring except for a curious, life-size terra cotta sculpture of a barefoot black boy seated on a black metal café chair. Warhol never ate at the huge dining room table. It was buried beneath mountains of junk mail and cameras. He took his meals in the country-style basement kitchen among cup-boards groaning with ceramic cookie jars and toxic Fiesta ware. 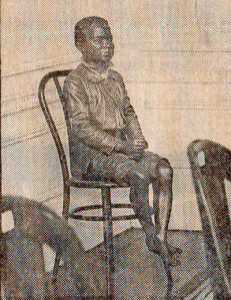 a life-size terra cotta sculpture of a boy seated on an art deco chair. 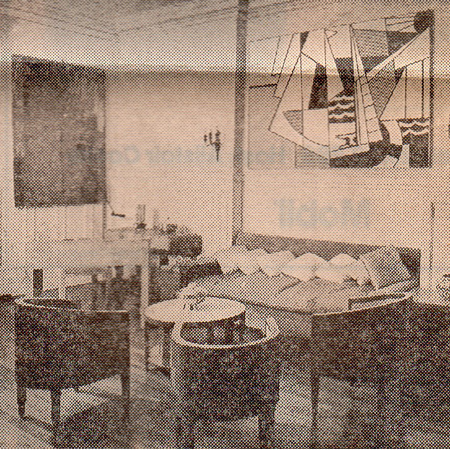 The first of two sitting rooms on the second floor was an exotic montage of paintings by Jasper Johns, Roy Lichtenstein, Picasso, Duchamp and Cy Twombly, offset by stunning examples of art nouveau and deco furniture. But the highlight of the chaperoned tour—conducted on the. 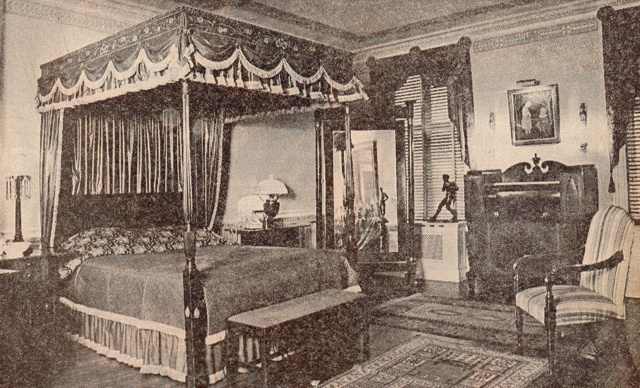 first anniversary of the artist’s death—was the master bedroom with its daunting canopy bed. Andy slept here, and though du spectacular 19th-century Josepl Whiting Stock portrait of “Two Littie Girls With Red Dresses and White Pantaloons” that hung over the mantel was touring other cities: (Los Angeles, Chicago; Frankfurt Cologne, London, Tokyo) as part o a presale campaign, there were bowls of potpourri and a seven-fool mahogany cheval glass mirroring the surroundings. Except for the giant Sony television screen camouflage beneath a mirror-topped cart, the pastiche of objects spoke of past centuries. “Andy was not a connoisseur,” said Bourdon. “He was a bargain hunter, a passionate shopper. He liked to buy in quantity. He always resisted things he thought were expensive. Andy was only interested in the hunt, in the chase. . . Once he had it in his bag, wrapped and ready to leave the shop, that was all that mattered. He didn’t care about displaying it. I don’t want to make him sound like some chintzy, two-bit collector,” Bourdon cautioned, “but he enjoyed the haggling. 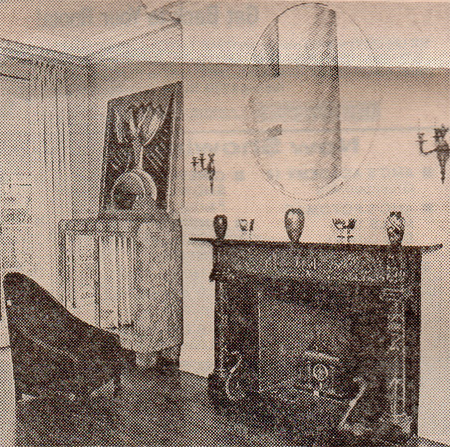 Warhol’s master bedroom, complete with canopy bed, brass-mounted mahogany cheval glass and cylinder-front secretaire. The 1969 show “Raid the Icebox With Andy Warhol” was culled from the storage rooms of the Rhode Is-land School of Design’s art museum in Providence, Bourdon remembers. It included American Indian blankets, textiles, French parasols, wallpaper, chairs and wedding slippers, plus paintings and sculpture. “He completely ignored the spectacular examples of block-front furniture of Rhode Island’s outstanding cabinet makers, but he stood enthralled by primitive little table with a top so warped as to be utterly useless. It was the warp he said that gave the table style. Warhol’s art deco sitting room with Roy Lichtenstein’s “Mirror,” 1971, over the mantle and Man Ray’s “Peinture Feminine,” 1954. Stuart Pivar, a major collector in his own right and a founder of the New York Academy of Art, remembers accompanying Warhol during the last years of the artist’s life of daily shopping expeditions “to see if we could come across a couple a masterpieces or some amusing junk.” They were trailed on such excursions by a limousine to carry till booty, he remembers. Pivar said Warhol envisioned “Warhol Hall” on Madison Avenue an enormous gift shop with a small museum attached to it in which he planned to display a sculpture collection he was assembling. Pivar said, “What happened was, he got very interested in pedestals when he found out they were harder to find than the objects. So he started making a pedestal collection.” Pivar considers Warhol the ultimate connoisseur who ploughed hi way through civilization via the sale: rooms of Sotheby’s and Christie’s flea markets in Chelsea, antique shops clustered near Union Square, in fact any emporium that had objects for sale. Pivar discounts the pack-rat theory and insists that his friend was about to embark on a major de-acquisition through auction so he could concentrate on his latest passion, classical antiquities. Another view of the sitting room, with Roy Lichtenstein’s “Sailboats.” 1974 over the couch and Jasper Johns’ “Screen Piece,” 1967. This entry was posted in Articles and tagged Andy Warhol, collecting, flea markets, Sotheby’s. Bookmark the permalink.